In some slot games it can take ages for you to get into a bonus round. However, there are many slot games that offer you the chance to see your account balance increase substantially thanks to the gamble feature and there’s no need at all to be looking for an expanding wild to come along and help you get some extra wins. The Gamble Feature occurs when you’ve had a win in normal play. Whether you actually take up the gamble is entirely up to you. If you’re happy with the win you’ve just had then ignore it and get ready for the next spin of the reels. Those of you who are on the brave side may decide to go for the gamble feature. If you do, the most common game sees a new screen appear. In the middle of the screen you’ll see a pack of playing cards. The feature doesn’t often link in with the theme of the game, sometimes it does though and the playing card may have the logo of the game. There’s two ways of winning money here. 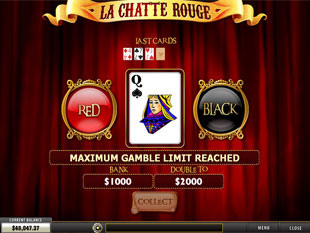 Playing cards are divided up into two different colours of cards – hearts and diamonds are red and clubs and spades black. You can gamble on whether the next card that comes up is going to be red or black. If your choice is correct then you double the win you’ve just had. If you make the wrong choice then you lose that win. Alternatively you can choose a tougher gamble. Cards are split into four suits – spades, diamonds, clubs and hearts. There are 13 each and you can gamble on which suit the next card will be. If you get the decision right, then your win is quadrupled. Again if you get it wrong then you lose your win. You can carry on gambling your winnings until you lose or you reach the game’s limit. There are other variations on the gamble feature. That’s most definitely the case with the BetSoft game ‘It Came From Venus’. This game features a plant that comes to Earth from Venus and lands on a farm. It loves eating apples and that’s the focus of the gamble feature in this game. Once you get a win you can decide whether or not to go for the gamble feature. If you do then a second screen comes up and this time you have the farmer and the alien creature. Your gamble here is whether when the farmer throws an apple to the alien it’ll manage to catch it or not. Another variation can be seen in the BetSoft game ‘Weekend In Vegas’. Here it’s called ‘Double Up’ but it’s the same principle. Your task is to decide whether the coin spin will result in a head or a tail. Get the decision right and you double your win. There’s another way of using playing cards in gamble features and that’s the hi-lo method. Here you are given a playing card and your task is to decide whether the next card will be higher or lower than the previous one. This can really be a gamble as anyone who ever watched ‘Play Your Cards Right’ on television will know. As you can see therefore, a gamble feature really can help you boost your account balance. Like any gamble though you have to be careful with it. It’s never going to be easy to keep getting the result right so learning to take your money and run really is advisable here.